Pay per click advertising, or PPC advertising, can help you improve the reach of your business by a significant margin. It is often used alongside search engine optimization so that the website gets the maximum exposure possible. PPC can significantly drive up the numbers of people visiting your ecommerce website daily. There are many advantages to using PPC marketing campaigns for your business and website. However, there are certain terms which you will come across as you get your marketing strategy ready. For a layman, those terms can be quite confusing. 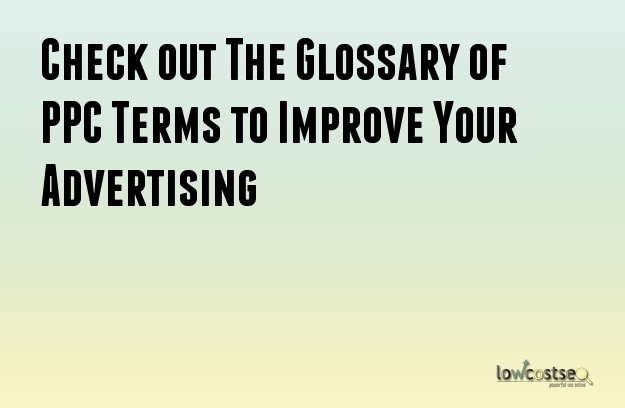 In such scenarios, this glossary of PPC terms can prove to be quite useful. A keyword can be a single word or a phrase which is used by a person in a search engine. Keywords are also known as search terms. Search engines scan for websites containing these keywords and display them to the user. These keywords are added to the ad group or campaign level. Unlike regular keywords, these are used to eliminate the display of ads for certain search terms. This is a tool provided by Google. It is used to conduct research on keywords and get information about them. This can include the statistics of the keywords, traffic estimates and keyword expansion amongst others. Keywords are placed inside these Ad Groups which have their own sets of advertisements. Whenever a user searches using those keywords, the corresponding Ad Group will be triggered and the advertisements inside it will be shown. These advertisements are shown in specific places such as the Content Network of Bing or the Display Network of Google. They can have static or dynamic images. You can submit a product feed to Google for your retail products. Whenever people search using the appropriate keywords, the ads will be automatically generated. This is a metric which is used to determine if your campaign is being affected by a particular keyword or ad. A low IS for a specific keyword denotes that people are unable to see that ad for some reason. This metric denotes the performance of your keywords. It is a ratio between the numbers of viewers against the number of clicks for a particular advertisement. It is an estimation of the quality of the keywords, the advertisements and even the landing page in a PPC ad campaign. This is one of the most important metrics as you will have to pay less if your Quality Score is high. The QS can be improved if you have a higher CTR. A PPC campaign can be used for bringing targeted customers to the website. After all, people who click on advertisements are more likely to be interested in making purchases rather than just information. By understanding the concepts and terms associated with PPC marketing, you may be able to improve the campaigns for better results.